This type of EDC was popular in the Swiss mountains and Southern Germany- but not only - in the XIVth to XVIth centuries (mostly), this type being late XVth century. The blade is 1080 steel, which was given a differential heat-treat (clay quench, in fact) to echo the original construction : a hard cutting edge and a softer back. Handle scales are walnut, the tubular rivets are made of hand-rolled 1 mm thick steel sheet. The bolsters and Nagel are mild steel, hand-filed (see other photo for detailed views). It is 362 mm long, with a 230 mm blade (which is 5 mm thick at its base). Thanks to my friend Alain for providing the metal and the first fire. Three main inspirational examples behind it, one being kept in the storage rooms of the Royal Armouries in Leeds (for the head shape and overall construction of the hammer, dated early XVIth century even though I do believe such types are earlier), the other being on display at the Chicago Art Institute (for the decorations and inlays, especially on the head - George F. Harding Collection, 1982.2122, dated first third of XVIth century), and a very nice and elegant piece kept in Rothenburg (for the shape of the cuts in the steel bands, dated late XVth century). The head itself was made using old, pre-Bessemer iron (ie at least 150 years old). Carbon steel (1075) was forge-welded in the cut-open beak to provide a hard point, exactly like what was done "back then" (you can see the faint weld lines on the pictures) : the idea is as always to keep hard but expensive steel where it's needed the most, and use cheaper and softer iron elsewhere. Brass was inlaid in recesses filed in the "corners" of the waisted sections between beak, hammer end and central part following the example set by the Chicago hammer. The oak core is surrounded on all sides by mild steel bands tapering towards the head (the taper was forged in) : the mild steel plate at its end is kept in place by the bands themselves, hammered in dovetailed grooves. On the left and right side of the haft, the bands fit in grooves cut in the wood. The side bands bear decorative cuts showing polished brass plating underneath, shaped in a delicate "Gothic window" form similar to the Rothenburg hammer. The brass inlays on the grip echo those found on the Chicago hammer - note than on the right side of it, the plates were brought forward as the band warped during the assembly of the hammer, and I had to find a solution (that wouldn't have been unused 'back then') to have them stay in place (especially the bottom plate) ; I believe such "imperfections" add character to the piece, as they're far from unknown on original examples. The clip is hand-shaped (hammer and file) mild steel made after the Chicago hammer, as I found it far more elegant than the Leeds example. The overall dimensons are 52.3 cm (length), 13.4 cm (head) and about 925 grams (weight) - wich makes it lighter than the Chicago hammer. 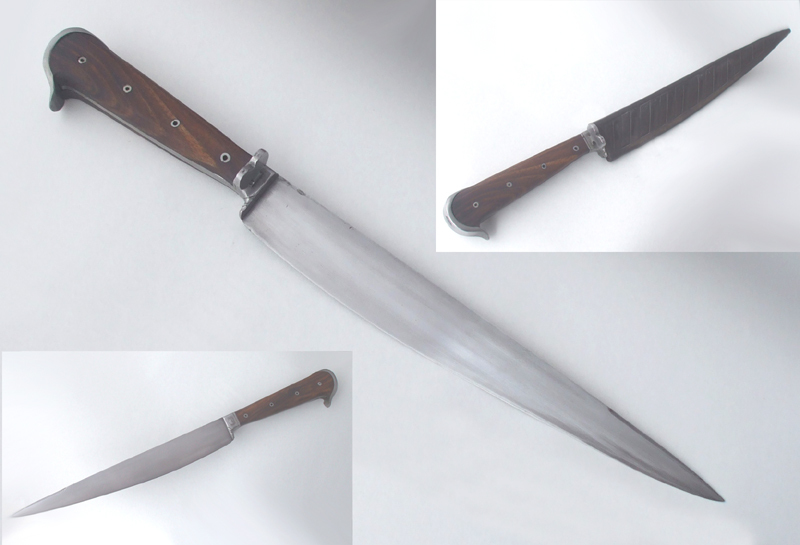 Measurements are 33.5 cm OAL, the blade is 24.5 cm and 6.5 mm thick at its base. As for several of my other medieval-style productions, I opted for a differential heat-treating to echo the construction found in period blades that associated a hardened, steel edge with a soft, unhardened iron back - the difference being that at that time the steel edge would be welded on the iron back (or core) to save steel as it was considerably more expensive than iron. You can see the wavy line resulting from this differential hardening process on the blade. ..currently kept in the Hôtel Sandelin Museum in Saint Omer, France. The original had a copper tube inside a bone handle, but I preferred boxwood over the latter as it was at the time more readily available to me. Besides, other dagger showing a similar construction or shape use different types of wood for their handles. The inside tube was made of carefully hand-turned walnut wood that would closely fit in the boxwood handle. Making the twisted part was a time-consuming process I must say, but full of lessons. The guard was hand-forged and then filed to shape in mild steel, then given a surface treatment resulting in a nice, dark patina. The Saint Omer dagger also had a two-edged blade, but ballock daggers of a similar type show variations in terms of blade shapes so associating it with a single-edged blade didn't look like nonsense. The end cap is brass, hammered and filed to shape. And it is too waiting for an owner. As always, mutliple instalments are highly possible. And make sure to visit (and like) my facebook page - search for "Fabrice Cognot Bladesmith". f*ck me Fab, that hammer is incredible! Liked your Facebook page, love the hammer! I really like the hammer, but the bollock dagger is amazing. Amazing stuff Fab. Keep up the great work! is it me, or does the hammer look oddly "architectural" in aesthetics and allusions ? Fab, I hope you're aware that every piece you make is a new way to f*ck with future historians. ..forgot to thank you all for the kind words, so : thanks. Get the hammer with 100 € off if you order it before the end of the month ! 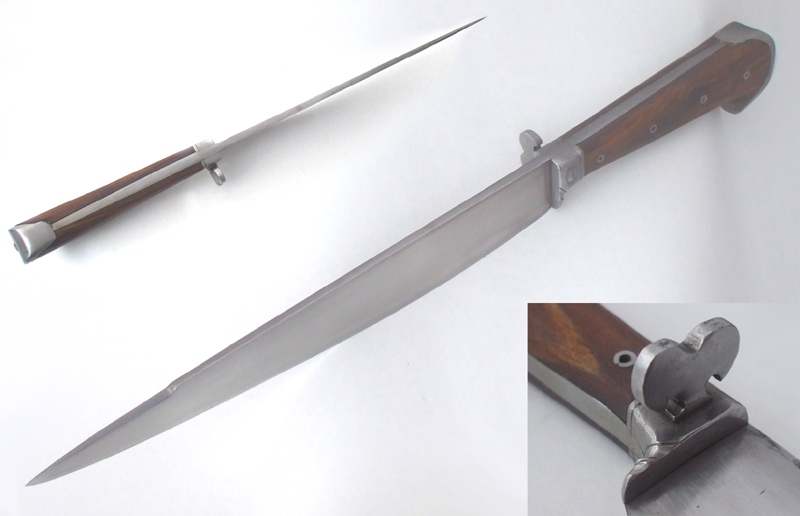 55S7 spring steel with a vegetable-tanned, natural-dyed leather handle wrap and scabbard. The blade was given a differential heat-treating. The blade tapers evenly from a thickness of 5 mm at its base. It's 129 mm long and 30 mm wide, for an overall length of 249 mm. The scabbard is hand-stitched and hand-carved from vegetable tanned leather of average grade, resulting in a worn, authentic look. The handle wrap is made of superior quality leather. And it's still available. 189€. Don't forget to check my facebook page for other peices - people attending the Vienna event can save on shipping costs as I can bring some of these with me. Dare I say a little bit of Perrin to be seen here? Really the like the workman like finish and slightly "used" look. I really like the hammer better than the others. And Im done liking ur facebook page. Military knives that are intended primarily for use in a role other than combat are typically referred to by their primary role.